Months ago I did this activity with Eli and totally forgot to post about it. 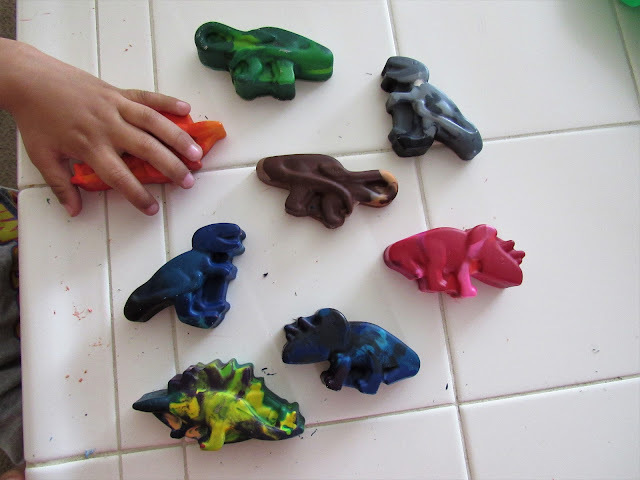 We use these "dino crayons" all the time, I don't know how I forgot. This is the perfect activity to do with kids on a rainy day or when you just want to get them to be artistic! 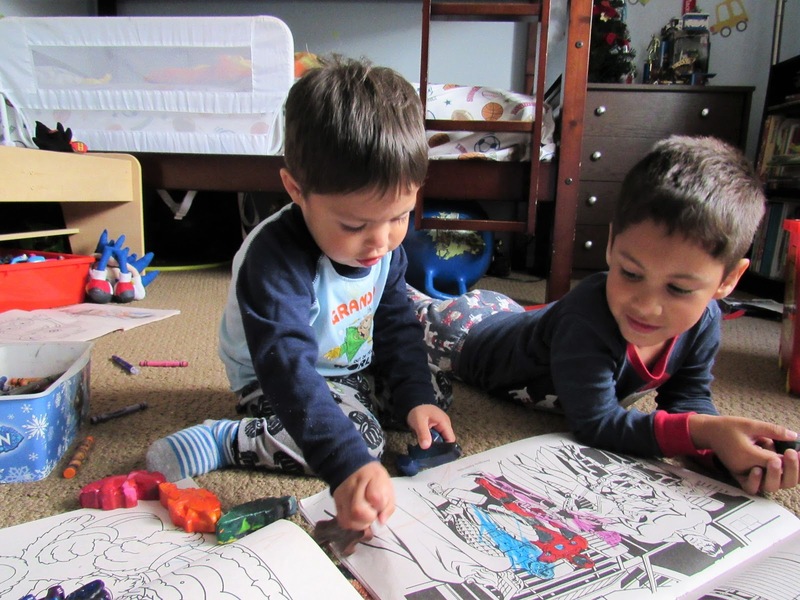 As the boys use the crayons down to the nubs, I save them in a ziplock baggy. They do a lot of coloring so this actually is a way to save us some money on crayons. For starters I have them help me peel the wrappers off all the little crayons. 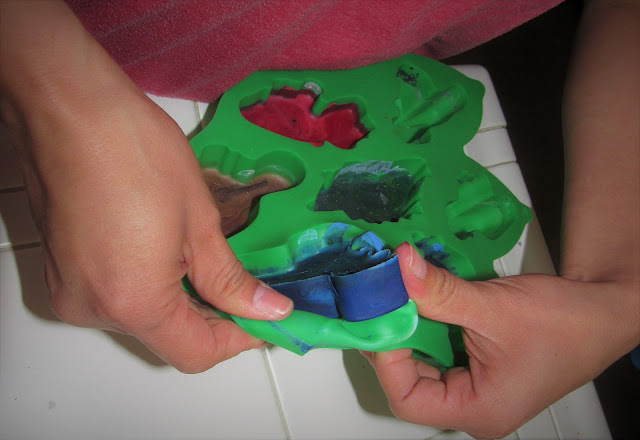 After deciding what colors of crayons we want to make we put them in a silicone molds. I have the kids get creative. Our most used colors like red and blue we stick to keeping the same, but some colors we mix up! 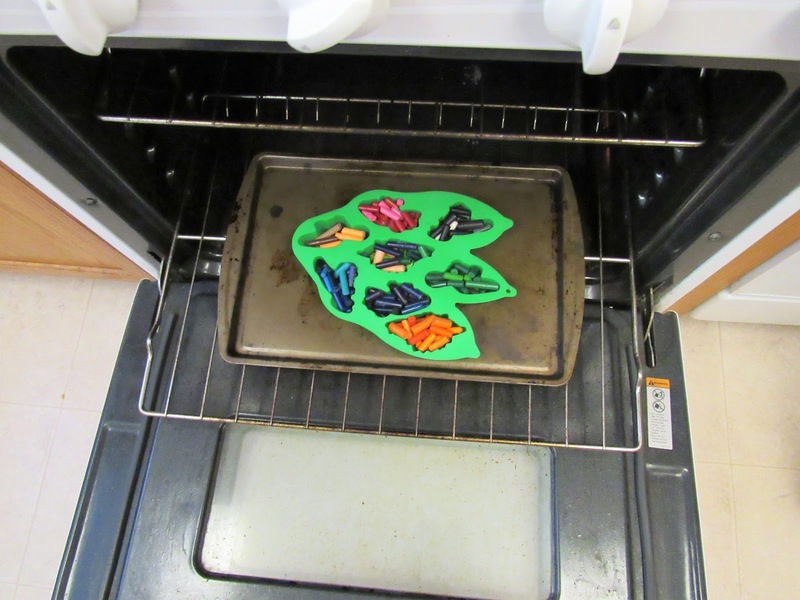 We then set the mold on top of a cookie sheet and bake them at 250 degrees for about 20 to 30 minutes, or until you see them turn liquidy. I then pull them out of the oven and let them sit for about 30 min or until they have completely hardened. Then I peel them out of the silicone mold and that's it! I have never tried doing this with a cupcake pan or other type of mold. I imagine it would be too hard to pry them out once they have hardened. Eli loved this activity. He asks to make more all the time. I also like that I don't have to worry about Josiah putting these in his mouth. He actually tends to play with them more like actions figures. 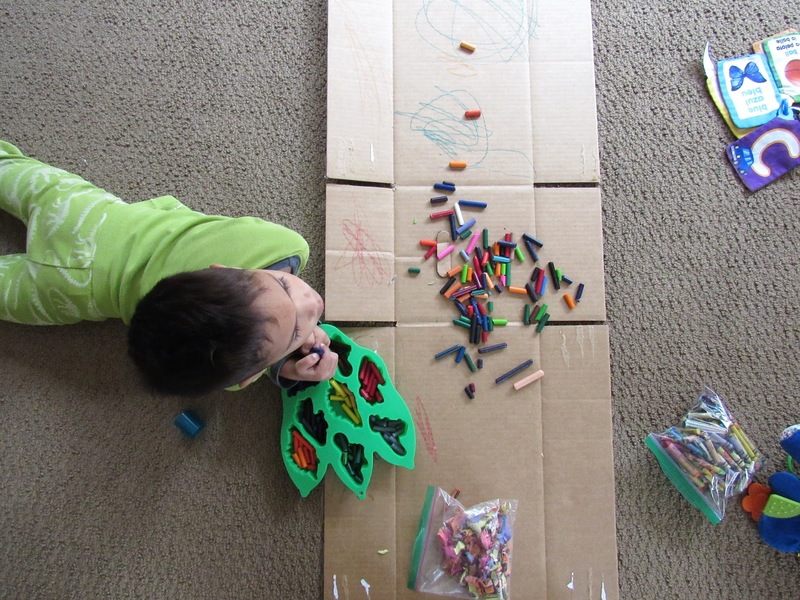 Hope you find this activity fun to do with your kids! Have you tried this before? Let me know what crayon diy's you like doing with your littles in the comments below! 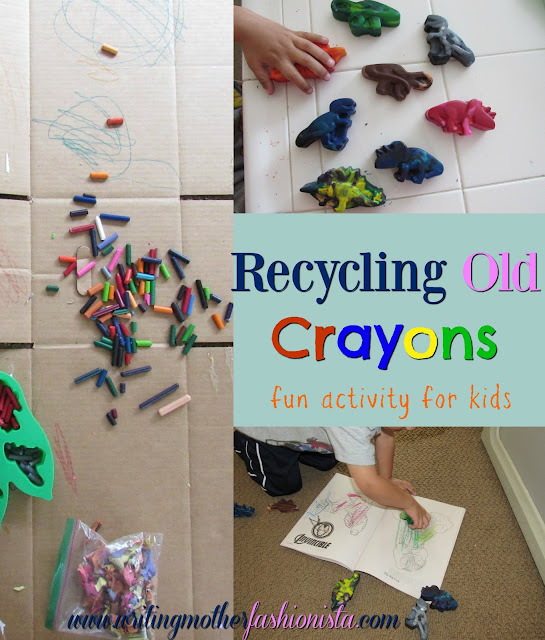 Such a great idea to recycle the old crayons! 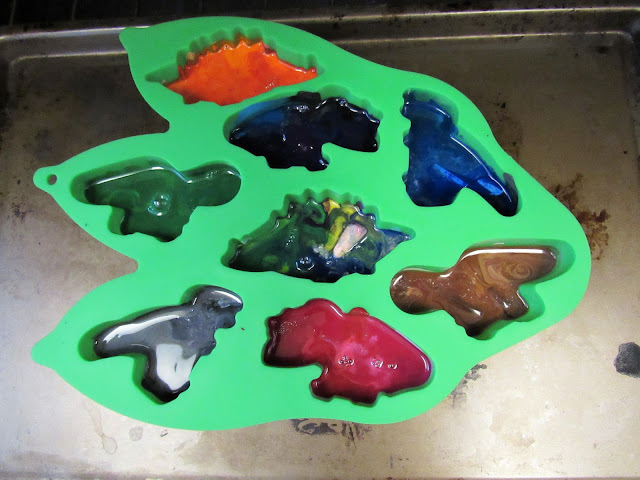 I love the dinosaur molds! We will have to try this sometime soon - I know the boys would get excited watching the crayons melt and molded into another shape! Hey Dominique! This is such a smart and creative idea, I love it!